The white-skinned draenei sighs deeply and sinks back into her chair. The bright blue of the night elf's eyes gleam with concern as he watches her. In a softer, more resigned tone, she continues her story, "After the Exodar I didn't really know where to go. I felt literally lost. 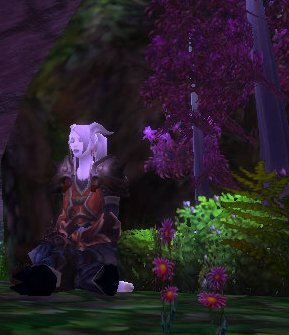 The draenei talk and talk about the Light, but none of it could bring the calm of the Light back into my life. I can't feel it anymore. There was that bright flash on that day at Light's Hope Chapel, the day we were freed from His control, but I have not felt it since. I thought maybe I was wrong. Maybe the night elves have it right in their worship of Elune. Maybe their teachings could free me." "I went to Darnassus in search of peace. I found a lot of peace, but none of it was in my heart. I talked to the priestesses. I talked to the druids. When that provided me with no answers, I went out into the wilderness outside of the city. I thought maybe being alone in the wild would allow me to feel whatever answers our world had to give me, or at least to more clearly hear my own thoughts, my own heart." "There, wandering in the wild, hunting and fishing and simply being, there I ran into a pack of worgen. I didn't even know they were out there. I'm not exactly the most adept hunter and tracker." She chuckles darkly at her own folly, "I should have known they were there. But I didn't, and suddenly there they were. I was surrounded in the middle of the woods. I didn't even have the heart to fight them, I felt so lost. Besides, they told me they didn't mean me any harm. They blindfolded me and took me to their secret meeting place, and there they presented to me a ritual used by the worshippers of Goldrinn. I watched a very young worgen undergo the rite and so temper the bestial fury within him." "Now, I am not, nor have I ever been, a worshipper of the demi-gods, the Ancients, just as I would never worship one of the dragon aspects, but this ritual seemed powerful. I spoke to one of their druids about myself undergoing the ritual, but the worgen didn't seem to think it would work on me, simply because I am not technically alive." "I was furious and left in a rage of destruction, taking down several small trees and killing a hapless wild owl on my way. Why had they even brought me there if they couldn't help me? What did any of it matter if I am dead anyway? My thoughts turned dark, Torq, and I thought of turning sides, appealing to the Dark Lady to take me in. At least then I'd be among other dead. I kept to myself for some time, brooding over these ideas before I returned to the city." "When I returned to Darnassus, as a last resort I tried talking to some of the night elf warrior women, the Sentinels. I think the Sentinels were more help than any of the others, but they couldn't understand why I wanted to rid myself of my rage. The difference is that they have something to focus that rage at, the protection of their people. Who are my people, Torq? Who am I supposed to defend? Who am I supposed to be fighting? The world itself has been torn apart, but will fighting bring it back together?" She shakes her head sadly and whispers, "I don't think so..."
He squeezes her hand gently, "You're right. Fighting doesn't often fix things..."
She frowns and removes her hand from his, slowly clenching it into a fist, "But I was created to fight. It is all I know to do." "Maybe it is time for you to learn something new to do." He shrugs. "You make it sound so simple." She scowls at him. He casually digs in a pouch, pulling out a random gizmo. As he does so there is a small but very fiery and brief lived explosion. She stifles a laugh. He coughs, waving a hand to clear the smoke and gives her a wry smile as he takes a spanner to the gizmo. "It is simple, Ice. This is how I moved on with my life. This is how I am free of my rage. I have something I enjoy doing that is also beneficial and engages my mind. You need a hobby, Ice." She looks down at her callused hands, "I am already a blacksmith. You know I patch together my own armor from what I can find." He chuckles lightly, "Everyone knows you patch your armor together from various scraps! No offense, but you're only a middle of the road blacksmith, and you don't seem to care to improve. You've got to find something you care about." She shrugs, "You're right. It's a useful skill, but I'll never be one of those to create ornate pieces. I may never be better than to simply patch pieces of metal together. What I make is utilitarian, beyond that I just don't care." He looks up from his work and into her eyes with a serious expression, "What do you care about, Ice?"